If you involuntarily put an ‘and’ before the number five, you know this one’s for you. If you’d like to get those moves a bit more polished, there are some pretty great dance studios in Gurgaon that will ensure that nobody puts baby in a corner. Here’s what we recommend. And 5, 6… and 5, 6, 7, 8! Founded by the rather well-known and very respected Ashley Lobo, The Danceworx takes every step seriously. They run batches for contemporary, jazz & ballet for different levels of expertise; moving up the ladder depends on your pace of learning and footwork. For those who have unpredictable schedules, they offer an Open Class schedule, which might work better for you. All courses need registration two weeks before batches begin, so make sure you call the office and find out about the admission process. The fitness studio focusses on fun ways to get fit like Fitness Zumba, Fitness Bollywood and Fitness Masala Bhangra. Leaving cardio aside, they also do a belly dance class, which isn’t structured like a workout, but you tell us how those abs are doing a few months down the line! Prefer ballet to belly, and wistful you missed out on this graceful art form when younger? It’s never too late to start, with CCB’s adult ballet lessons, which are open to all age groups, and overall a great workout for mind, body and balance. 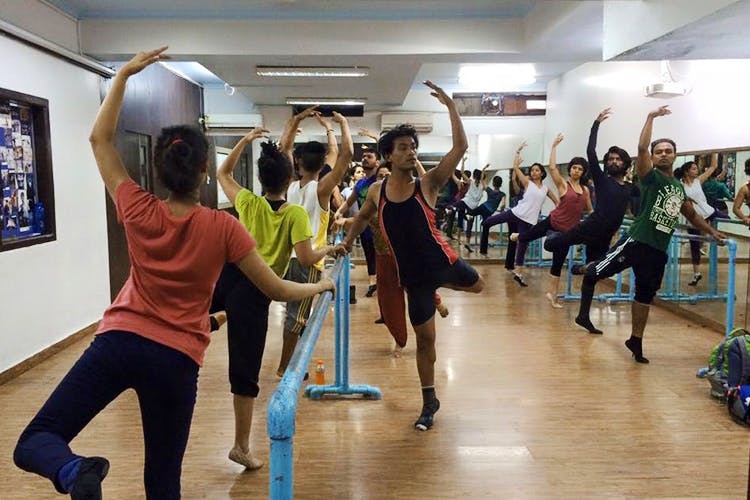 Started by India’s only male ballet dancer who’s trained in the US and Korea, their Contemporary Ballet class incorporates some serious technique and will have you paying attention from your fingertips right down to your tippy toes. This is easily one of the best dance academies in Gurgaon. The trainers are specialists in styles such as hip-hop, contemporary, salsa and bachata. They also have four different levels for all styles—beginners, improvers, intermediate, and advanced—depending on your proficiency in the style; therefore offering a different learning experience for all kinds of dancers. From hip-hop and contemporary to Bollywood, they do it all. They have students across ages, and they even have special batches for toddlers and senior citizens. Apart from dance forms, they offer fitness oriented classes such as zumba, and aerobics as well.